A Guest Post by Linda Cee. One of my favorite things to do is tapestry crochet. it’s very similar to regular crochet with the exception that 1 or more strands of yarn, either different colors or different shades of the same color, are carried while another is being crocheted so that the finished results look more woven then crocheted. It’s an art form that has gradually been gaining in popularity. 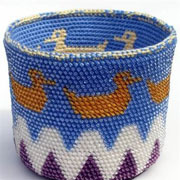 Perhaps because it is very versatile a fact that well-known tapestry crocheter Delores Chamblin alludes to when she refers to her work as “Painting with yarn” and just as the design options are limitless so are the items you can make everything from jewelry to toys to shawls and baskets. Personally my favorite thing is to simply make it up as I go along I might start out to make a scarf decorated with a diamond pattern and end up with a shawl that alternates between diamonds and flowers however most tapestry crochet designers use graph paper to assure success. One of the biggest problems beginners and even pro’s have is keeping the yarn from tangling. While many patterns call for only 2-3 colors others call for upwards of 7. One way to deal with this is to put each ball of yarn in separate small baskets. I hope this article will inspire at least one person to try tapestry crochet it is truly a gorgeous craft and well worth the work. Stay posted for patterns to come and more information about tapestry crochet. Linda Cee is a young adult who enjoys many crafts including crochet, jewelry making, scrap booking and learning to tat. She also enjoys traveling and learning everything she can about history and foreign cultures. This entry was posted on Saturday, July 2nd, 2011 at 12:00 AM by A Guest Writer	and is filed under Tutorials and Help. You can follow any responses to this entry through the RSS 2.0 feed. You can leave a response, or trackback from your own site. Crochet Spot Oscar Mystery CAL Winners! Thank you, LInda Cee! I love this and would love to learn how to do it! DO you have any sites that you would recommend? I highly recommend http://www.tapestrycrochet.com it explains the basics as well as having a lot of patterns but if you are looking for a beginner friendly pattern I will have one here on Crochetspot soon. Thanks for the heads up, I hadn’t heard it called Intarsia. I was just thinking about this today, so your post is very timely. The links to the patterns are great–she provides additional how-to links. I’m gonna try this! Thanks!! I started a tapestry crochet of a red race car for my son… a few years ago. He’s 6 now and if I don’t get back at it he won’t be interested! It’s meant to be a bedspread. To make it big enough for his full sized (double) bed, I’ll need to granny crochet around it. Problem is, in order for it to be a surprise I can’t work on it with him around. What to do about the more than half a dozen other unfinished projects I have on the go… hmmm. Someone told me when crocheting with more than one color yarn to put a straw in each color. This helps to keep the yarn from getting tangled. It works for me. Putting each color of yarn through a straw is a great idea! Straws are inexpensive and easy to find and the straws can also be cut easily with scissors if they are too long. Straws also come in several diameters that’s perfect for yarn and are light weight and thin, so they won’t be cumbersome to work with. Also a small slit can be cut at the end of the straw to secure the yarn even better until that yarn color is ready to be used again. (I often work with too many colors and/or large pieces, so I don’t always carry yarn in every stitch). Before typing this, I tested the idea with an unused straw I had at my desk. It his also call a Tunisian stitch? Using a special knitting needle with a crochet “head” on on end – crochet it onto the needle then crochet it off? 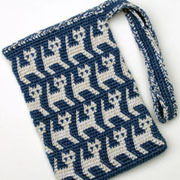 The end result of the Tunisian stitch is like a knitted piece very similar to your tapestry. Sometimes there are many names for the same technique. Your work is beatiful. Thanks for sharing and showing us a whole new technique! Brenda U, thanks for the tip!!! I had never heard of using straws, thanks for the tip it certainly would be cheaper than baskets although I love to crochet baskets. The tunisian stitch is a different technique, but it is also used for making “picture” afghans/items like a tapestry. The tunisian stitch is also called afghan stitch, afghan crochet and tricot crochet. 1) made the columns more narrow than the rows and 2) tested it first! In other words, a tunisian stitch is narrower than a single crochet stitch. As a test, when a (tunisian) square actually looks square, the columns are the correct width. Oh well, live and learn! Delores, your creations are so beautiful. I would love to be that talented. When Brenda U posted the idea of using a straw, I decided to try it right away, even though I wasn’t crocheting at the time because it just sounded like such a neat and logical idea. Linda you may still need baskets to hold your skeins of yarn, but using straws to keep the yarn from tangling definately is an idea worth trying. Putting a small slit at the end of the straw would be similar to the notch that’s in yarn bobbins to keep the yarn from pulling through the skein when you are not using that strand and the strand is still attached to your work. Crocheting with more than one color or skien of yarn attached to your work at the same time or simply moving and turning the piece you are working on or pulling a strand that you are using can cause the strands to become twisted and tangled. It can get really tangled if you are not very careful. Thanks for the compliments Nancy and Tina K.
Here is another tip if you want to design your own picture and use a stitch that is not close to the shape of a square to create your work, but still want to use standard graph paper that’s easy to find in stores: Simply determine how many stitches it will take to be the closest shape to a square. 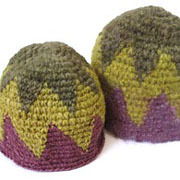 For example two double crochet stitches is the closest to a square. One double crochet stitch is more like a vertical rectangle and 3 double crochet stitches is more like a horizontal rectangle. So in this case on the graph paper each square would equal 2 double crochet stitches. But the row of squares on the graph paper would equal only one double crochet row. Thanks for the mention Linda Cee. Sorry I didn’t acknowledge you previously. It was just an oversight on my part. I was just sitting here yesterday sipping a cup of coffee and suddenly I see Delores Chamblin has written a comment, if I hadn’t been afraid of waking everybody in the house I would have screamed, I was that excited!!! So thank you for reading, actually thank you to everyone that reads this. I missed your post, Rebecca but your afghan sounds lovely!!! About your son getting to old for it, I have 20-something friend that would still love something like that (of course he’s a big Nascar fan too). Thanks so much for helping spread the word about tapestry crochet and for including some of my projects! I wasn’t clear in the last sentence of my previous post. It should be: Each row of squares on the graph paper would equal only one double crochet row. In other words, each box equals two stiches, but each row of boxes still equals only one row. I am going to attempt to demonstrate this visually below without actually using graph paper. Assume I = 1 double crochet stitch and I I = 2 double crochet stiches, then I I = 1 square on the graph paper. First I must say that your works are absolutely gorgeous!! Second, I want to say thank you for explaining the pattern – graph idea. I am very new to even the idea of tapestry crochet (havent even made my first piece yet) but I already know I want to design some pieces. Once I get the hang of it! I love the tip about using the straws, I’m sure that is going to help immensely! Thanks again! Ventura’s Tapestry Crochet book when I was in the US this summer. I just started a few rounds of the Kitty Bag and the tight stitching feels good.